The plants and vegetables in this greenhouse have overdosed on plant food and have risen up against their farmer to take over the garden and wreak havoc on the natural crops. 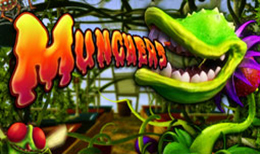 Munchers is a 5 reel online slot game where you must tame greenhouse creatures by matching paylines of overgrown beetles, and Venus flytraps to restore serenity to the garden and earn some lovely cash rewards. NextGen is one of the market leaders and never disappoints their players with their exciting products.The company was founded almost two decades ago and have become very popular amongst their audience. The vast repertoire is packed with different themed games to please a wider audience and offer high-quality products to guarantee entertaining and engaging gameplay experiences. The development team at NextGen is innovative and energetic and creates unique and fun mechanics to enrich their game design choices. If you are looking for a little dangerous adventure then this game is the right option for you. Munchers offers a great setting inside an abandoned greenhouse that is overtaken by carnivorous plants and creepy little bugs and crawlers. There is a light bulb swinging on the ceiling and a bucket hanging on the left. The reels are in the middle of this scenery and are framed by more plants. Underneath you find the playing controls and some plant pots that have only grass growing inside. On the five reels and three rows you can see the usual playing card symbols A, Q, K, J and 10. They look very slimy and are also overtaken by the plants. There are also some theme related items on the reels such as a big orange spider in its net, a red-eyed flying bug, a crossed fork and trowel, and some old gardening gloves. A massive carnivorous plant is the wild and will help you form winning combination as it will substitute for any other symbol, except for the scatter. Look out for the red and green dotted watering can as it is the scatter of this game. Land three or more of it anywhere on the reels to be awarded 10 free spins. All wilds that you will land during this feature will turn into expanding wilds. Also the pots that were mentioned earlier that you will find underneath the reels will randomly grow plants that cover the entire reel they grow on and turn them completely wild. Unfortunately there is no multiplier added to your wins during this feature nor can you retrigger it during the free spins. To add a little more risk in this already exciting game you can opt to play the gamble feature by pressing the gamble button underneath the reels after a win. You are asked to guess the right colour or suit of the next drawn card and if you succeed you may double or quadruple you win. This feature is limited to five right guesses but if you fail you will lose all your winnings of this round. If you would like to try this dangerous game with carnivorous plants and various insects and pump your adrenaline up a little you will have to place a minimum bet of 1p or up to 50 pounds. There are 25 paylines and with the many wilds during the free spins you might turn your game very profitable. Muncher offers an immersive gameplay experience with a great story to it. With the free spins feature and the many wilds that might result with it you may turn your spin very lucrative. The aesthetics are great and add a lot to the game feel. Munchers is a great variety of the common themes you will find amongst other video slots.